Fall is right around the corner! Time for shorter days, cooler temperatures and new foods in season. Autumn brings a diverse selection of healthy and delicious produce that can be used to create some terrific meals. Looking to expand your recipe collection? We highlight 9 of the best foods to cook with this fall! Did you know there are more than 7,500 apple varieties? This fruit is packed with vitamins and antioxidants – an apple a day keeps the doctor away! You can do so much more with apples than eat them plain. Make great pies, jams and add sweetness to a savory dinner. The color of a beet can range from golden to dark red. This versatile vegetable can be eaten raw in salads or roasted in a side dish. Eating beets may help prevent heart and liver disease – their greens are actually the most nutritious part! Cruciferous is the cabbage family of vegetables: Broccoli, cauliflower, Brussels sprouts and the like. These fibrous vegetables have a slew of health benefits, including the prevention of many chronic diseases. Cruciferous vegetables can be eaten raw or cooked! This purple-skinned vegetable is high in fiber and low in calories. Eggplant can reduce the risk of heart disease and lower blood sugar. When you’re looking to cut back on red meat, eggplant makes a great beef or sausage substitute in lasagna! Mushrooms are a type of fungus; the non-poisonous varieties can be enjoyed many ways. Although mushrooms grow year-round, certain kinds are at their peak in fall and winter. They can act as a meat substitute for a healthy, filling meal. This type of fruit is high in soluble fiber, a plant-based nutrient that can help lower bad cholesterol. Pears can be eaten raw or cooked and enjoyed in breakfast scones, desserts – even cocktails! Pumpkins are a common Halloween decoration, but they’re also a food that promotes healthy vision and cell growth. There are many fun ways to eat pumpkin, including roasting the seeds and blending pumpkin in a smoothie or yogurt parfait. Summer squash varieties last through October, but winter squash follows close behind. 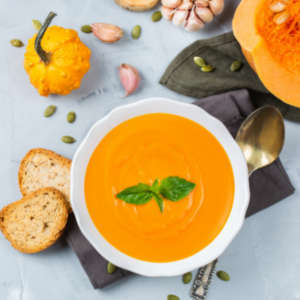 Just in time for the holidays, you can enjoy acorn, butternut and spaghetti squashes – a great way to cut back on starchy pasta! Potatoes are a guilty pleasure for many people, whether enjoyed mashed, baked or as chips. Sweet potato is a healthier alternative to your favorite starch. They are high in fiber and promote healthy eyesight. Colony Diner proudly serves seasonal meals with fresh, local ingredients. Stop by our Wallingford restaurant to enjoy the best foods fall has to offer!